well-known, affordable, and efficient companies around. A dirty air duct system is inefficient, costly, and can worsen symptoms of allergies or asthma. Dirty air ducts can contain dust, hair, mold, mildew, and soot, which collects on the air duct surfaces, and goes into the air that you breathe. KIWI’s detailed air duct cleaning process can eliminate all of this debris and prevent mold growth in your system for two years with our antimicrobial treatment. 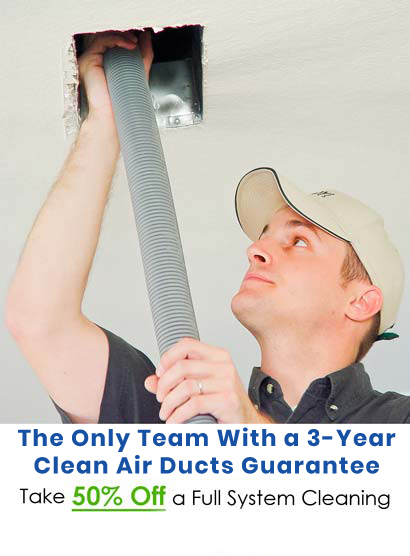 Our company offers a two-year guarantee on all full-service air duct cleanings, which promises that there will be no regrowth of mold or mildew within two years of your service, or we will reapply our antimicrobial treatment at no charge to you. We promise that you and your family will always have fresh air to breathe in your home. Call KIWI Services today to schedule an air duct cleaning in Romayor!